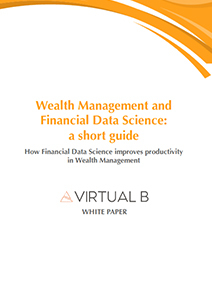 How Financial Data Science improves productivity in Wealth Management? Data Science is everywhere. Data is the fuel of the digital economy. There has been an explosion in the velocity, variety and volume of data of all kinds: social media activity, mobile interactions, real-time market feeds, customer service records, transaction details, information from existing databases – there’s no end to this tidal wave.